The Turbosmart Electro-Mechanical Blow Off Valve has taken yet another performance industry award at the 2019 Australian Automotive Aftermarket Association Innovations Awards. This is the second massive industry award that the EM-BOV has received in less than a few months with the product also gaining the prestigious SEMA Street-Performance Award for 2019. The AAAA Innovation Awards was no small feat, consisting of a thorough entry submission and weighted on a marking system of objectives, solutions, innovation and result of the product on both the market which it services and impact to the Turbosmart business. “The whole team is really excited to receive yet another industry award of this calibre for the Kompact EM product range. We have worked really hard on this product and are quite proud of it. It is more than just a new solution for our customers, this symbolises our passion to keep pushing forward and forging new innovations for the industry and that’s really what this award embodies and what it means for our business,” stated Stewart Mahony, Group General Manager, Turbosmart. The Universal Kompact EM-BOV allows for seamless integration into vehicles which require actuation of the BOV to be controlled via the engine ECU without compromising flow or performance. The new universal Kompact EM BOV range flows at higher levels than existing compressor cover solutions and provides an alternate option where hybrid turbochargers demand more flow to prevent the compressor falling into surge with rapid load changes. “The Turbosmart Kompact EM-BOV was born out of a company-wide philosophy that sees the business determined to stay ahead of the curve when it comes to adopting and implementing new technologies that can service the demands of the ever-changing automotive industry. As the modern turbocharged engine was moving towards electronic technologies, so too did the aftermarket accessories needed to support it,” stated Turbosmart CEO & Founder, Nic Cooper. During data intensive rounds of R&D, Turbosmart’s Engineering Team found that OEM valves are commonly built from sub-par materials to speed up their manufacturing process and reduce the costs of production. “Due to the use of the nature of their design and materials used, OEM products can fault over a period of normal use, but in particular, during periods of increased load when boost pressure is raised during the tuning of a vehicle. This can cause valve leaks meaning that the vehicle can not maintain a controlled level of boost pressure for maximum performance. Ultimately this can cause the OEM ECU to register a fault which causes the vehicle to go into ‘limp mode’ by decreasing the boost pressure to protect the vehicle” stated Christopher Doumbos, Turbosmart Head Engineer. With this knowledge Turbosmart went about sourcing significant amounts of OEM data, physical turbocharger units and whole vehicles to work on the development of the product. Using Turbosmart’s unique pressure control system from existing product ranges, Turbosmart was able to quickly implement the same technology found in their long-standing and successful range of Kompact products with their all billet construction and high-temperature o-rings. While fitment and construct is something that Turbosmart has long perfected, determining how each vehicle ECU would respond to the solenoid required for electro-mechanical response was a whole new challenge. Turbosmart wanted to make a unique product that required as little possible input from the user; a true, world-first, plug-n-play solution. This required significant amounts of fine-tuning to the product to make sure that the introduction of a solenoid system to the top chamber of the valve responded in the same way across a range of vehicles and offered the customers a hassle-free solution. Again, the R&D department went to work on testing the solution across a range of scenarios, including dyno testing and road testing prototype units under different conditions. With each simulation and test, the product was refined to ensure seamless integration. 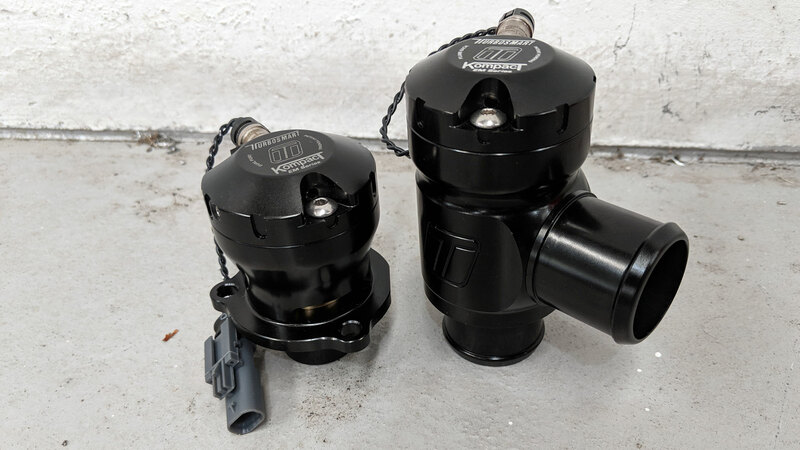 Eventually, the Turbosmart Kompact EM-BOV was developed as the world’s first aftermarket replacement Blow Off Valve for both direct fitment and universal replacement. To see the full range of Turbosmart Kompact EM-BOVs, visit www.turbosmart.com today or speak to your local Turbosmart distributor.